CABI is a not-for-profit organization set up by the United Nations treaty, with over 100 years of operation and nearly 50 membership countries, including Canada. Throughout its existence, CABI’s mission has been to improve people’s lives worldwide through the transfer of information and scientific innovation relating to agriculture and the environment. A few of its goals include the improvement of food security worldwide, the preservation of the environment and biodiversity, and the transfer of sustainable agronomic knowledge to farmers. One of CABI’s current focuses is researching the impacts and management tools involved in invasive weed species. CABI has generated decades worth of scientific knowledge and research, with massive improvements in agronomic practices, including pest and environmental management. In addition to its global research, CABI’s publishing efforts provide funding for rural development projects, spreading wealth and agronomic knowledge to some of the world’s poorest communities. CABI’s influence is also felt Canada-wide, with research partnerships in many provinces, helping to educate Canadian farmers on agricultural innovation and tackle the many challenges faced by the modern farmer. One of CABI’s current focuses is researching the impacts and management tools involved in invasive weed species, many of which have European sources. Oxeye daisy (scientific name Leucanthemum vulgare) is a well-known aggressive weed in North American pastureland, as well as other natural landscapes. The shallow root system of this plant promotes soil erosion of agricultural lands, and it is avoided by grazing cattle in pasturelands where its populations are often dense, reducing the amount of available feed. Farmers can combat this weed with regular mowing and herbicide applications, but both methods are time consuming and costly. And while these control methods present challenges in an agricultural setting, they are even less effective in a natural landscape where broad spectrum herbicides and mechanical controls are not feasible. In an attempt to better equip farmers with a means of control for this weed, scientists in both Canada and Europe are investigating a more ecological approach: introducing insects as a weed suppressant. 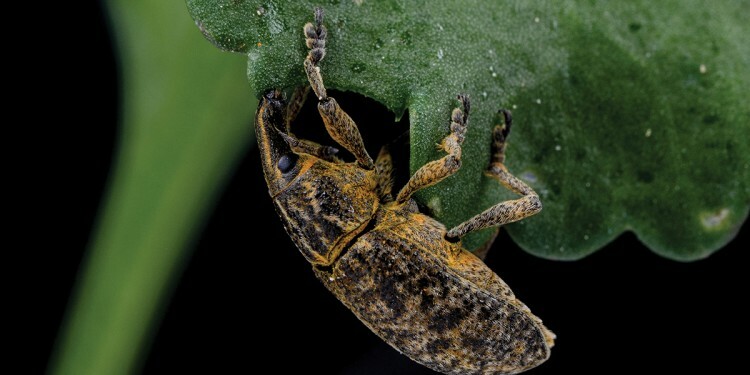 Biological control, or the introduction of a living organism as a means of weed or pest suppression, is growing in popularity as a management tool as scientists and farmers look for innovative control methods for the ever-evolving list of pests they are forced to deal with. A successful example of such a control would be the use of the parasitic wasp (scientific name Encarsia formosa) as a means of greenhouse whitefly suppression. This insect has been used for decades as an alternative management tool to chemical application, helping to minimize whitefly populations on important greenhouse crops like tomato and cucumber. It is this successful model that scientists hope to use as a basis for a similar relationship between insects and oxeye daisy. The CABI centre in Switzerland, in cooperation with North American institutions, has spearheaded the research program that hopes to find a viable biological control candidate for oxeye daisy. 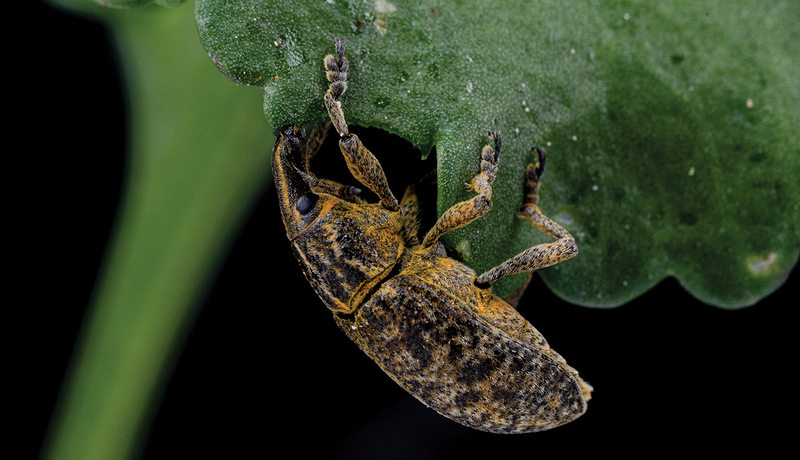 Sonja Stutz, PhD student at the University of Fribourg and researcher at CABI, is currently looking at four possible insect biocontrol agents, including a root-boring weevil, a root-boring moth, a flower head-boring fly, and the rare European root-feeding weevil (pictured above). Each of these insects attacks the target plant in some way, hopefully suppressing its growth and limiting spread in the field. The research involved in ensuring the insects’ feeding specificity is very time consuming, and must take into consideration the possibility of the insect attacking a non-target plant, with the greatest concern placed on native North American plant species or those with high economic value. And with current field research underway at the CABI facility in Delémont, Switzerland, progress is being made with very promising results. Research projects such as Stutz’s, as well as the work of other innovative scientists based at CABI, contribute information to a bigger scientific picture, allowing agricultural practices and the livelihoods of farmers to evolve and improve on a global scale. The research centre in Switzerland serves as a base to both scientists and students, many of whom hail from Canadian universities. Several projects are currently underway, including other invasive species and biocontrol work, as well as integrated pest management programs and ecosystem research. The rest of CABI’s exciting projects can be seen online at www.cabi.org. Energy Pipelines and Agriculture: How much do we stand to lose/gain?